I’m so happy that you have joined me for Tablescape Thursday. Everyone who knows me, knows that I love birds. I enjoy watching birds, listening to birds, and feeding the birds. I have a few bird houses in my backyard and love watching all the new baby birds hatch. Just recently we had, seven precious ducklings hatch in our front flower bed. Today’s tablescape is a tribute to the birds. For the place setting, I chose Mikasa English Countryside china with bird accent plates. I used blue and white striped sear sucker napkins and anchored the place setting with yellow straw placemats and gold charger plates. The flatware is Reed and Barton Haversham, and the crystal is Fostoria American. The bird accent plates each have different scenes. For the underpinning of the tablescape, I chose a blue tablecloth with yellow embroidered flowers around the edge. I ran a fringed burlap table runner down the center of the table. The burlap table runner is very easy and inexpensive to make. I purchased burlap at the fabric store, measured and cut it to size, and made fringe by pulling the threads. I pulled the threads until I got the desired amount of fringe. For the centerpiece, I placed a jadeite cake stand, added greenery, and perched a bird in the center. I also placed a decorative nest that I already had at the base of the cake stand. Flanking the centerpiece are Fitz and Floyd Candlestick holders with ivory candles. Also placed among the centerpiece are gold bird statues and antique bottles with flowers from my garden. I’m so happy that you stopped by. I hope that you have a blessed day and a wonderful weekend!!! Hi Chloe! Thank you so much for the very sweet comments. I would love to share my tablescape at Celebrate Your Story. I hope that you have a blessed day and a wonderful weekend!!! Such a lovely tablescape. So bright and summery. I too love birds and your accent plates are so beautiful. I love the F & F candlesticks and all the details that went into making this all work together beautifully. Hi Kathy! Thank you so much for your very gracious and sweet comments. I’m so glad that you love birds too. I love to decorate with bird themed items. I hope that you have a blessed day and a wonderful weekend!!! Thank you so much Pam! I hope that you have a wonderful weekend!!! I love the beautiful bird salad plates. Your table conveys sweetness and whimsy. The adorable nests and ceramic birds and striped napkins makes me feel I am peering into a fairy tale book. Hi Marsha! Thank you so much for your very sweet comment. I’m so happy that you stopped by, and I hope that you have a wonderful weekend!!! Hi Shannon, Your bird plates are beautiful. I’m loving the textures of your tablescape it’s refreshing and summery. Seersucker is one of my favorite fabrics and I don’t see it too often. Hi Wendy! Thank you for leaving such a sweet and kind comment. I love seersucker too! I found these napkins for a very good price at Sur La Table. I’m so happy that you stopped by, and I hope that you have a very happy and blessed Sunday!!! This is beautiful Shannon, thank you for joining us at Celebrate Your Story. We hope to see you again! Thank you so much Sandra! I hope that you have a very blessed and happy Sunday!!! Absolute perfection! Such a beautiful table, from the plates to the centerpiece, the flatware, I could go on and on. I also love how you placed the napkins. Hi Valerie! Thank you so much for your very sweet and gracious comments. You are too kind!!! I’m so happy that you stopped by, and I hope that you have a wonderful week!!! So pretty. The bird theme is awesome. I really love your tablescapes. Hi Krisit! Thank you so much for your sweet comments. I appreciate all the support that Dave and you have given me. I hope that you all have a wonderful week!!! So pretty! Love birds – they fill our yard with such beauty and chirping happiness! Such a clever centerpiece using the cake stand. Great job! Hi Carole! Thank you for stopping by and leaving such a sweet comment. I hope that you have a wonderful day!!! What a beautiful table setting! Love those plates. Thank you so much Pamela! I have had those plates for a very long time. I purchased them 12 years ago at Old Time Pottery. I only have six. I wish I could find more. I’m so happy that you stopped by, and I hope that you have a wonderful week!!! Oh how I love those bird plates! Your tablescape is so pretty and looks so calming and inviting. 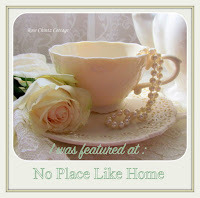 I have just now discovered your blog and so glad I did! Hi Julia! I’m so happy that you found my blog! It is so nice to meet a new friend! Thank you so much for your very sweet and kind comments. I’m so glad that you stopped by, and I hope that you have a wonderful weekend!! !